so was the appearance of the brightness all around. 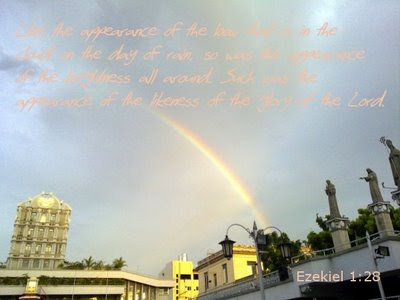 Such was the appearance of the likeness of the glory of the Lord. This photo was taken by the IT Guy outside Basilica Del Sto. Niño de Cebu. His office is just across the church and he took this photo on the way home using his cellphone only. Well for the past days, weeks most of the photos you've seen here which was taken recently were all from cellphones. Nature always fascinates me! It never failed to amaze me. And every time I see rainbows (even in photos) and other wonderful nature scenes it just humbles me. How great is God's glory...it manifests in so many ways everyday! This is one of the many reasons why I love the outdoors...I love spending time with nature...because it bears witness to God's glory and power and it reminds me that miracles happen every minute of every day. I school we are taught why rainbows are formed. Surely most of us can explain why...but the why of all whys...I doubt it. Many attempted...and they are still searching for the answer. I am happy I have found my answer...GOD sends me rainbows...to give me hope...and to glorify Him. How do you look at rainbows? I wish you all a RAINBOW filled Wednesday! I am so glad that God sends us rainbows. Bless you for sharing this. Beautiful picture. I am fascinated and intrigued by nature as well. Thanks for sharing. Happy WFW!! And I wish you a life full of rainbows! I love rainbows and there has een more then once in my life where the sight of one reminded me of God's promises and helped me keep going. Thanks so much for sharing. I am just now catching up on some blog hopping to see others posts. You have a great site and I love your picture. Thanks for sharing. I am hosting "5 Things Friday" on my blog at http://jeanstockdale.typepad.com and I hope you will stop by and play along. Blessings.